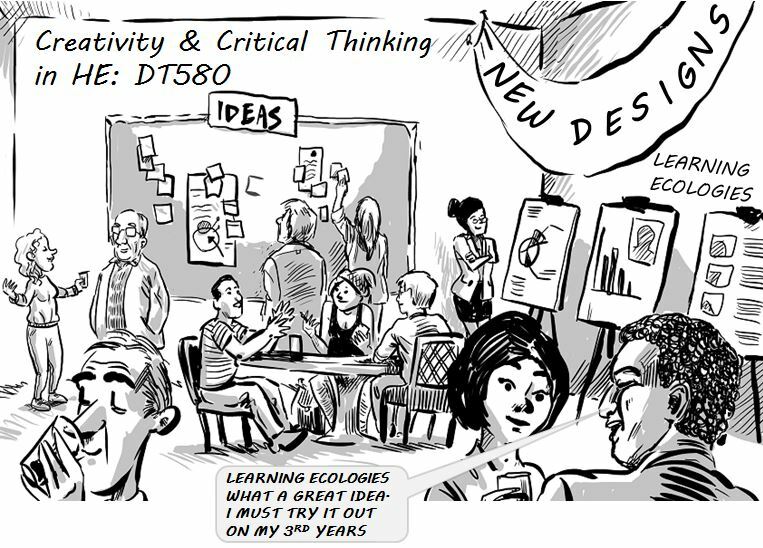 An ecological perspective on learning requires teachers to think of themselves as part of an ecosystem within which teaching and learning takes place and to think of the ecologies that they are creating to facilitate students’ learning and creativity through their pedagogical thinking and practices. This talk will explore the idea that teaching, learning and creativity are ecological phenomenon and encourage participants to share their perspectives. I am looking forward to meeting you at the seminar on Tuesday. I would like my talk to be informed by your perspectives so I have created a short questionnaire which I would be very grateful if you could find the time to complete before lunchtime on Monday. I will present a summary of the results in my talk. 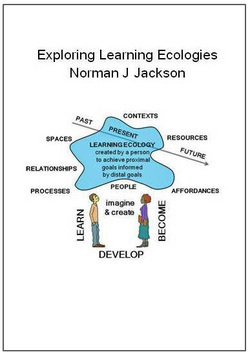 My new book explores the idea of learning ecologies and applies it to higher education teaching and learning practices and the everyday world of learning and achieving in the wider world. It can be purchased from LULU the on-line publisher. May 12 2016 This webpage provides resources to support my talk & workshop. In this short clip Dewitt Jones talks about a professional assignment he undertook as a photographer. In the story he reveals the learning ecology he created in order to achieve his goals in an unfamiliar, unstructured environment for learning. Preparing a talk for a conference is always a great incentive to learn something to explore a new perspective. Preparing for DIT's conference on Educational Climate Change: Exploring Our Learning Environments got me thinking about the idea of educational climate change. It's not a term I have come across before in the UK higher education sector. The term 'climate' is used in schools particularly in the US where it is defined as “the quality and character of school life'.... School climate is a group phenomenon that reflects the school community’s norms, goals and values, and school climate emerges based on ways in which students, parents and school staff experience school life. This meaning didn't seem to work for the change context of the conference so I went back to the idea of 'climate' as a phenomenon involving the overall pattern of temperature and precipitation experienced in a particular regions of our planet. These zones are affected primarily by latitude, altitude, wind movements, distance from the sea and major sea currents. From year to year the climatic zones appear stable but on the scale of decades, centuries and millennia we can observe shifts in response to fundamental changes in such things as rises in greenhouse gases and global changes in ocean currents as polar ice melts. Humans adapt to live their everyday life in different climatic zones and as change is slow, in general, they are able to cope with the effects of change. Within climate zones we have weather and weather can be extreme. Severe weather, for example storms and flooding, requires us respond immediately to the situation. So climate and weather provide us with metaphors for viewing the conditions for change within a higher education system. The educational climate relates to the constellation of beliefs and ideas that transgress societies about the purposes of higher education, conceptions of learning and the way learning can be encouraged and supported and the meanings of a university. The educational climate is nurtured by the global pattern of educational discourse and the sharing and discussion of new ideas as they emerge and are distributed through books, social media and conferences and slowly translated into beliefs and social practices. Within this constellation of climatic beliefs and ideas we have the equivalent of weather. These are such things as new government policies such as the introduction of hiking of tuition fees in England, new forms of regulation like the Quality Framework developed by QAA in England at the start of 21st century, or the introduction of new institutional policies, frameworks strategies and imperatives. Like the weather we experience on a daily basis, such things require us to respond quickly and sometimes dramatically. But individuals (the innovator's and organisational leaders) generate their own institutional 'weather' when they come up with new ideas and invent new social practices that impact on the institutional environment or ecosystem. A few years ago I was invited to make a study of the way a university had tried to change itself through a three year programme of strategic change and encourage its staff to innovate. It was very noticeable that the institution created its own climate for positive change which enabled staff to want to be involved and make change happen. It seemed to me that this climate for educational and institutional change was underpinned by a set of principles that related to leadership and management and the environment. These factors and conditions are listed below. ​These factors go a long way to showing what is important in creating an institutional climate within which people feel encouraged, trusted and empowered to contribute to the strategic change process through their own efforts and inventions. Climate is very much part of the institutional ecosystem and any institutional ecosystem that wants to involve people in innovation needs to be mindful of whether its own climate promotes or inhibits change or simply sustains what already exists. 1) Baker, P., Jackson, N.J. and Longmore, J. (2014) Tackling the Wicked Challenge of Strategic Change: The story of how a university changed itself Authorhouse.